Python, the dynamic object oriented programming language created by Guido van Rossum is known to deliver both the power and general applicability of traditional compiled languages without the complexities accompanying them. Coupled with its ease of use, programs written in Python can be run on multiple Operating systems and system architectures which gives it the same portability of any interpreted language. My first brush with Python was when I tried out a beautiful game called PySol — which is more like a collection of over 200 card games and PySol is entirely coded using the Python language. Nowadays a variety of Python web frameworks have also cropped up which promise the same kind of rapid application development that is possible using other programming languages. I found the book titled "Core Python Programming" authored by Wesley.J.Chun and published by Prentice Hall to be an ideal book to learn the wonderful Python language. This book is quite voluminous, with 23 chapters spanning 1050 pages. The book is divided into two parts the first part titled Core Python which contain 14 chapters which impart a sound understanding of the semantics of the language and the second part titled "Advanced Topics" which contain a collection of 9 chapters which give a good introduction to the specialized uses such as in database programming, network programming, using threads in python, GUI programming and so on. In the first chapter of the book, the readers get to know the various features of Python and the steps needed to install Python on ones machine. When you install Python on your machine, it also provides its own shell where you can execute pieces of python code. The author has taken advantage of this functionality of Python in narrating the concepts throughout the book. Each concept and syntax is followed by bits of code which the readers can try out in the Python shell in its entity. I found this process much easier in learning this language as one need not go through the write -- compile -- execute cycle which is more prevalent in the traditional languages. In depth coverage has been provided for important concepts such as lists, tuples and dictionaries as well as data-types and string sequences and they have been provided separate chapters of their own. The sixth chapter titled "Sequences: Strings, Lists and Tuples" is the second largest in the book and is quite detailed in its coverage of the topic. Chapter 9 deals with file manipulations where the author introduces all the built in functions available in Python which allow one to open, read from and write to a file. Interestingly, the functions are also illustrated by aid of short easy to understand examples. A couple of modules related to file handling are also introduced in this chapter. Errors and exceptions form the basis of the 10th chapter where different errors and exceptions supported in Python are explained. This chapter also explains how programmers can create custom exception classes which I found quite informative. One of the biggest advantages of Python is that all its functionality is split up into modules. A module could be just a single python file which contain a collection of functions or classes which can be re-used in programs written in Python. And all one has to do is import the module into ones programs to start using those pieces of code. The chapter 12 titled Modules give a firm understanding of this concept and also introduces different ways in which you can import external pieces of code into the Python program. Chapter 13 titled "Object Oriented Programming" is by far the largest chapter in this book and spans over 100 pages. In this chapter, the author endeavors to give a sound base to Object oriented concepts as well as how they relate to programming in Python. The author introduces a large number of Python classes, methods and descriptors in this chapter. Regular expressions play a very important part in programming verily because manipulating text/data is a necessity. And it is possible to easily modify and mould data to ones choosing by way of regular expressions. Python has strong support for regular expressions. The second part titled "Advanced concepts" of the book starts with a chapter on regular expressions. In this chapter, one gets to know about the regular expression module and many functions associated with the module. The author also provides a couple of examples which give insights into the ways in which regular expressions can be used in Python to reformat data. The next two chapters give an introduction to the world of sockets and how Python can be used to write client server programs. Multithreaded programming forms the basis of the 18th chapter. Here the author introduces a couple of modules available in Python which make it quite easy to create threads in ones Python program. I found the chapter titled "Web Programming" very interesting to read. Especially since Python is used in a large way to create dynamic websites. And the next chapter titled "Database programming" gives a sound introduction to the Python objects which allow one to easily connect to and retrieve data from the databases. I found this book really informative, especially suited for upcoming Python programmers. At the end of each chapter, there is an exercise section which imparts a nice touch to this book as it allows you to test your knowledge. Even though the advanced topics (second part of the book) are not covered in depth, the author succeeds in providing enough knowledge about the relevant Python modules and functions followed by a couple of examples which whets ones appetite without overwhelming the reader. 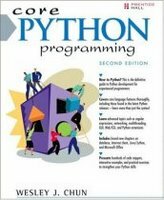 This is the second edition of the book and it has been significantly revamped to include new features introduced in Python 2.5. Rating : Excellent Book to start learning the Python language. The author Wesley J. Chun has been a former employee at Yahoo and has played a major role in creating Yahoo Mail and Yahoo People Search using Python. He has over 20 years of experience in the IT field with over a decade of experience programming in Python. Would you recommend this book for someone looking to learn how to program properly? Or is it more useful for those who already understand the concepts of programming and want to learn python quickly? I would say both. The author's main focus is those in your latter group, but he does give lots of good advice on proper programming and good Python style.